THROW ME A COCKTAIL, MISTER! Mardi Gras = Fat Tuesday = Shrove Tuesday. Traditionally the day before Lent where you enjoy favorite foods before fasting. The cocktail most associated with Mardi Gras is probably the famous Hurricane created at Pat O'Brien's in New Orleans. Of course, being a port city with a colorful pirate history, New Orleans is well known for it's rum cocktails and the Hurricane has rum in abundance. 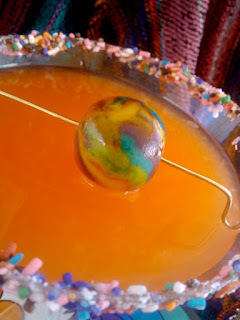 Created during World War II when many spirits were hard to obtain, the Hurricane and many other now famous Mardi Gras cocktails featured rum which was readily available and cheap. With my martini version I have basically cut down the size of the measurements in order to fit the Hurricane into a martini glass but the flavor is all Carnival. 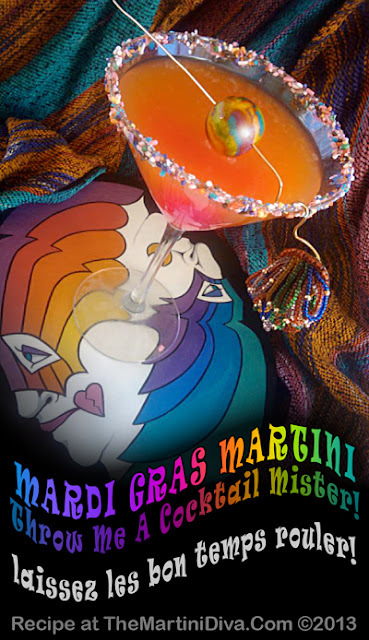 If you really want to put the Mardi Gras spirit into your martini, wrap one or two strands of Mardi Gras beads around the stem of the glass or toss a gold foiled candy coin into the drink. I had some homemade marzipan so I just garnished mine with a homemade, rainbow marzipan bead. Dip the rim of the cocktail glass in some of the pomegranate syrup and then into the rainbow sprinkles, then chill the glass in the freezer. Shake all the ingredients except the 151 rum with the ice in a cocktail shaker, pour into your cocktail glass then float the 151 rum on top. WHY IS IT CALLED FAT TUESDAY? Mardi Gras is French for Fat Tuesday aka Shrove Tuesday. It is the culmination of the Carnival celebration that begins on Epiphany and ends the Tuesday before Ash Wednesday which is the beginning of Lent. It's called Fat Tuesday because it's the last day before the ritual fasting of the Lenten season and is therefore a day of feasting. The alternate moniker for this Tuesday before Lent is Shrove Tuesday which derives it's name from the verb "to shrive", meaning to obtain absolution for one's sins. Traditionally celebrated by parades, parties, masked balls and general abandoned merriment where beads and gold coins are tossed from floats, tops are lifted up and decorum is left on the street along with the trash (which, btw, is weighed every year in N'awlins to measure how successful the party was), Mardi Gras is the biggest, longest lasting party on this planet! Mardi Gras has become associated with New Orleans and Rio de Janeiro but it is celebrated the world over, especially in areas where the Catholic Church held influence. Let the good times roll (laissez les bon temps rouler).